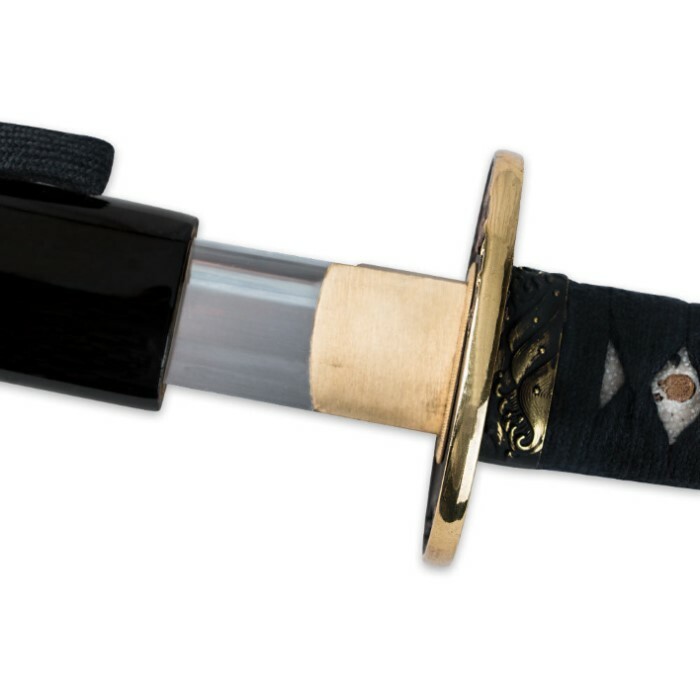 Current stock features the same clay tempered blade as our Bamboo Warrior Swords. Handmade, the blade is thick and comes extremely sharp. Like the more expensive models this blade can even be bent 45 degrees. This sword is well balanced and the tight handle wrap feels great. Comes complete with a black cotton storage bag and Musashi retail box. This sword is my second in a span of 10 days. I first bought the Bamboo Warrior w/ red saya and this blade is identical with different furnishings. Another super shape very well made sword with beautiful hamon running the length. Both swords are near perfect and you just can't beat the serice from Trueswords.com. I have a real Katana I bought 30 years ago and these are my favorite to play with. They cut like butter and look fabulous. I'm an extremely happy customer!! Very high quality sword for only $80. Everything look very great and solidly built. Very sharp, beautiful looking looking blade, nice looking hamon, and HI (groove). All parts are metal. Blade stays in position and is not loose at all. Feels very good with a swing and makes that whisper sound from the blade. Very beautiful Saya (scabbard). It is made with hard wood and the high gloss paint and color looks amazing. The mouth of the Saya or the opening part of the saya looks high quality done looks similar to the Thaitsuki Nihonto sword which has the outer black layer and inside hardwood layer on the mouth. I would say this sword is worth $200-400 the way it has been built and detailed. 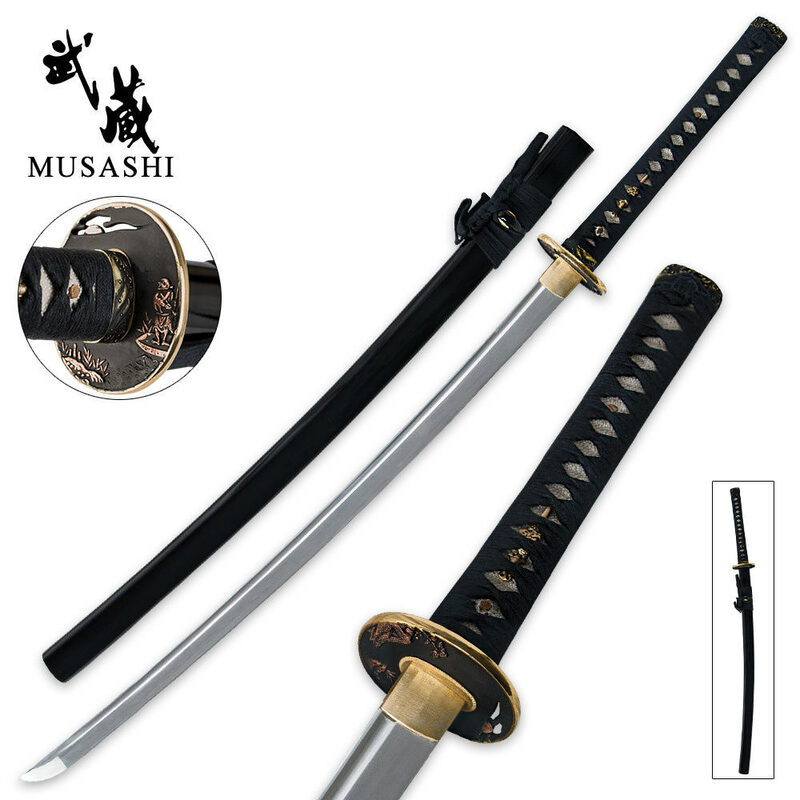 Best of all a great sword can be fully disassembled and assembled which most Musashi are able to do. Great buy For sure.It come pre oiled to keep from rusting during shipping.Though it shipped very very fast. 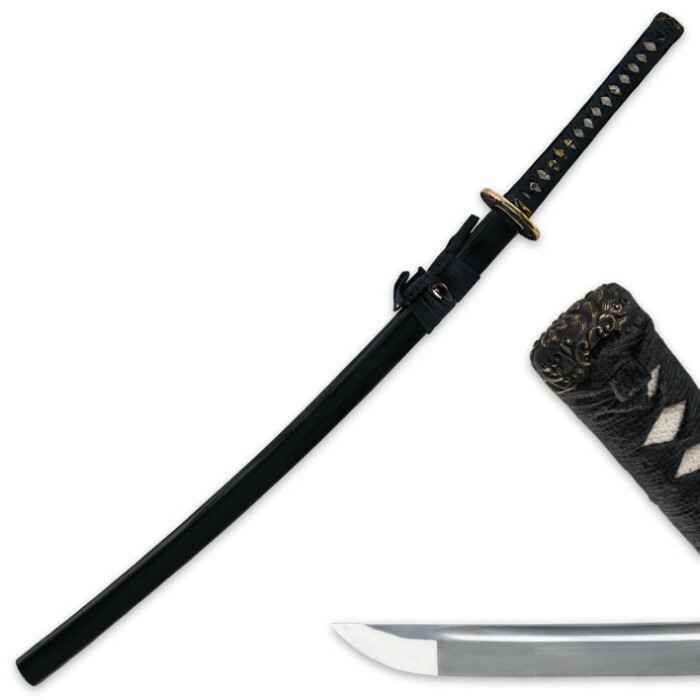 No damage to it.The tasuba also has a man on the back of it that is not in the picture.The handle is great tight rap.Very sharp and just a great Sword.$200 Sword for $79 must buy for anybody.5 stars for me.